This is 100% our own unique hodgepodge of a recipe. I can’t deny it took some major playing around to make it taste like a post-able recipe. 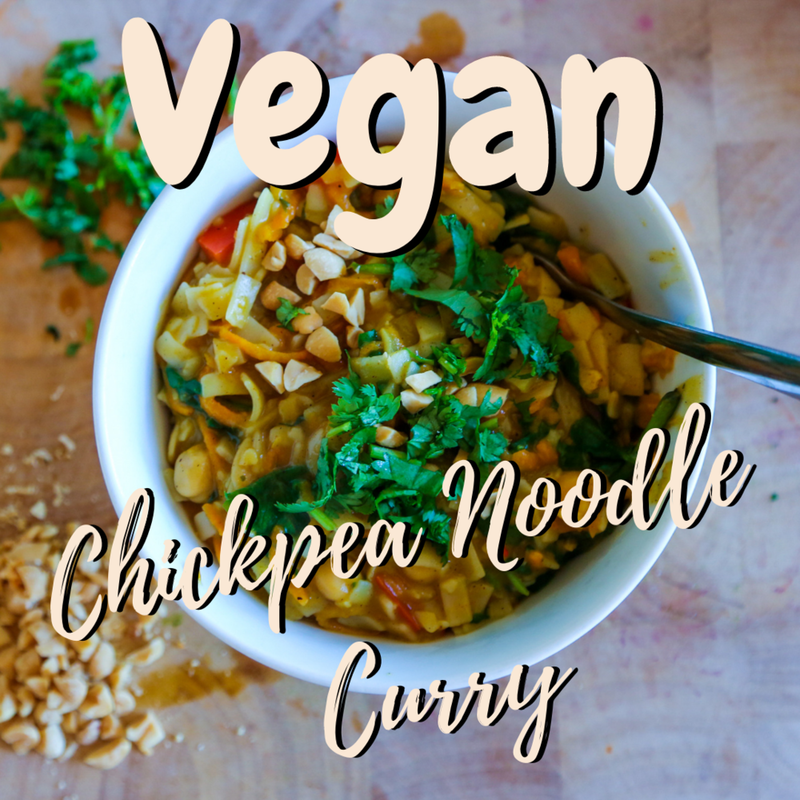 I’m a MASSIVE fan of Asian food and after a week of eating raw vegan, I reaaaally wanted to eat some piping hot curry, but with noodles instead of rice. My boyfriend, Nick, thought I was mental for wanting to add noodles to a curry. “It just doesn’t go,” he said. But…I’m 30 now, so doesn’t that mean I can have ice-cream for breakfast and noodles in my curry if I want it? That’s the freedom of adulthood, isn’t it? Welp, it does for me! And smoosh it all together into something a hungry vegan would want to down after eating raw for a week. Even though I was ready for carbs and cooked food, I did want some coconut curry concoction that I could slurp on and enjoy the flavors. This recipe ticked off everything on that list. Since going vegan, I’ve really come to appreciate the beauty of using spices in my cooking. Nick and I have experimented so much that we have started to figure out what combinations go both excellently and terribly together. It’s important to know both. We’ve also clung onto some favorites and cooked them on repeat, which is why piecing together something brand new is always a treat. Variety is THE spice of life, so the more you can learn about cooking, the more variety you can introduce to your palette. It’s the difference between pasta and red sauce every night (which is still awesome — no judgement here) and picking your dinner based on a specific country around the world. International taste buds of mystery! Eating is the best activity…ever…and everyone around the world knows it. So why not try everyone else’s favorite foods around the world and see what happens? Now, Nick was not pleased with how this recipe morphed once we added Thai (rice) noodles. By the end, however, he was actually surprised that the noodles “Thai’d” it all together. The dish is not Thai — I have to clarify — but it does have elements of my all-time-favorite: Pad Thai. Oh wait, I definitely mentioned that earlier, but I love it that much I don’t care! To acknowledge Nick’s concerns, the noodles didn’t really absorb the flavor at first. After a while, though, they soaked in a lot of the coconut cream and spice combo to round out the dish. The longer we left it all to simmer and sit, the better the texture became. We even made so much of this dish that we had it for lunch the next day and the noodles continued to absorb the flavor. I recommend making enough for left overs. Your lunchtime self will thank you tomorrow. 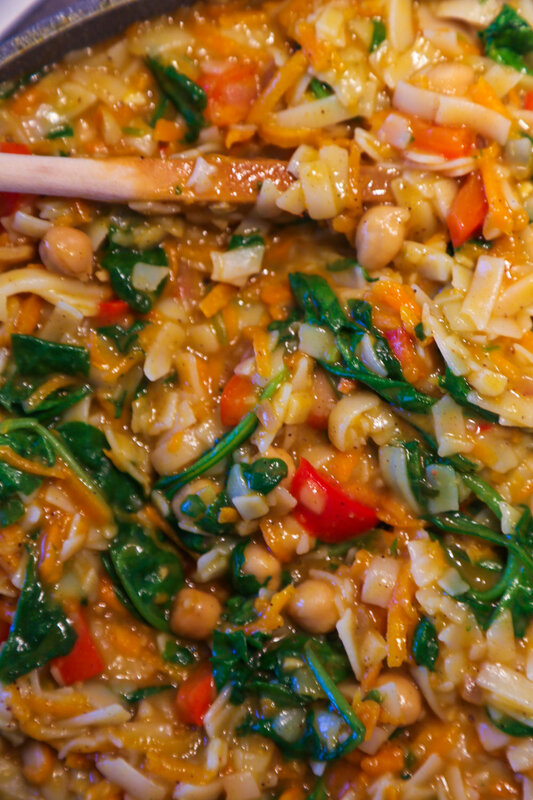 The spinach, carrots, and red pepper made the dish nice and colorful adding some vibrancy to the dish. (I’m a sucker for a colorful meal). Feel free to use whatever veggies you’d like, though. These are just the ones we thought would work best with the flavors at hand. Chickpeas are typically awesome in curries. Since the majority of the meal is pretty soft by the time it’s ready, add some peanuts for a nice crunch. Plus, it’s a little thing I stole from my all-time-favorite dish: Pad Thai. Have I told you it’s my favorite yet? I may just write a song about it so the world knows how much that meal means to me. If you top the dish in a bit of coriander/cilantro as well, you’ll notice the nice coolness the herb brings to the curried spices. Again, the more we’ve played with spices…and herbs…the more we’ve learned what works well together. Nick is also obsessed with coriander/cilantro, so he puts it on everything. Some people think it tastes like soap, but I think it’s the same as the “Yanny/Laurel” fiasco. Half of people will like it. Add cilantro if you’d like. Don’t if it tastes like soap. Fry chopped onions, garlic, chili pepper for 3-5 minutes until soft. Add chickpeas and spices. Sir to combine. Add chopped red pepper, grated carrot, and some chopped fresh coriander stalks before stirring in coconut milk. Pour coconut milk and 1/2 cup water into pan and bring to simmer. Cover and continue to cook for 15-20 minutes. Noodles will eventually soak up flavors and the longer you leave it, the more they’ll take on the essence of the dish. Serve with chopped peanuts and fresh coriander. Tell me EVERYTHING so know how you feel about it!